Roasted Figs for sale. Buy online at Zingerman's Mail Order. Gourmet Gifts. Food Gifts. The flight of the figs. Franco Rao's figs are an eagerly awaited seasonal crop, preserved in the a way that's traditional in Calabria. Prized dotato figs are picked by hand when they are fully ripe, beginning to dry and concentrate. They're caramelized over twenty-four hours in a low-temperature oven, a step almost no one takes because it adds extra time and expense. The impact on flavor, however, is immense. These figs have a roasted, caramel-sweet flavor that's irresistable. 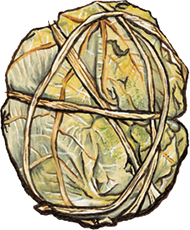 Hand packed in a ball the size of an apple, wrapped in fig leaves and twine. It's a traditional way to store them, rustic and attractive. We fly them in immediately after the fall harvest and what we have is all we get till next year—get yours before they sell out. They are great with yogurt, with cheese, with ice cream. As a gift for someone with an eye for rustic foods with real flavor, you won't find much better. "I’m a fig aficionado, and I never tasted figs so delectable as these... Just eat them. They're incredibly good."